Welcome to the Sumner Lab Blog! I am a new PhD student in the lab and my project is focussing on using social network analysis to assess how certain pesticides might be affecting social interactions within bumblebee colonies and how that could impact colony performance. One of the early challenges facing me is learning how to establish my own bumblebee version of The Lord of the Flies. With any luck, isolating small numbers of individual bumblebees into ‘microcolonies’ for my research should be much less disastrous than the fate of the marooned schoolboys in William Golding’s dystopic novel. My blog is about this fascinating and useful technique for studying bumblebees that I have been trialling over the past month or so. The bumblebee queen in the early days of developing her colony is the only individual who lays eggs. However, the queen will begin to lose control over worker reproduction as the population of the colony grows large and her pheromones lose effectiveness. The society seems to descend into chaos, as certain dominant ‘elite’ female workers will start to compete with the queen and lay their own eggs. These eggs are always haploid males because the workers are unmated. This worker reproductive plasticity in displaying queen-like traits is interesting and can be exploited in the laboratory to help us understand the development of bumblebee social structure. These traits can also facilitate research into other aspects of bumblebee biology such as their response to toxins , diet , gut microbiota  and disease transmission . 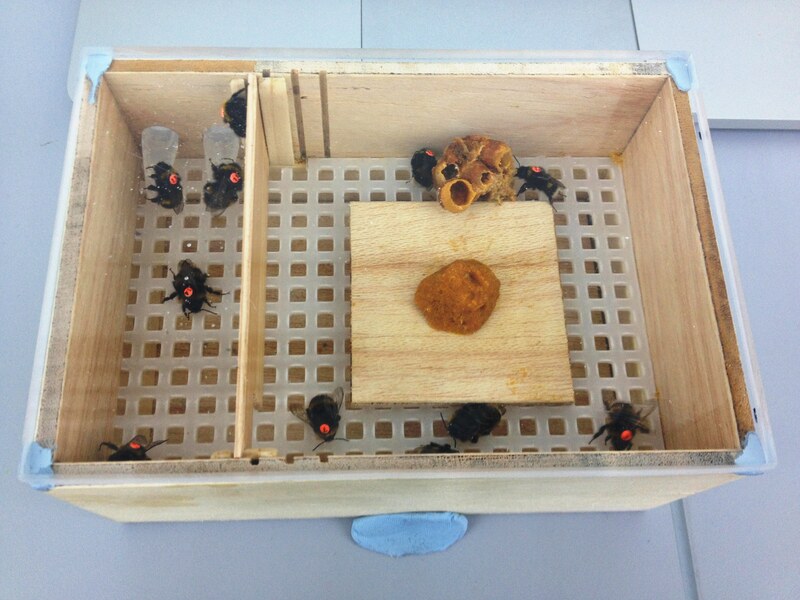 In the laboratory it is possible to establish bumblebee microcolonies by separating a small number of worker bees from their original colony and isolating them in their own mini nest-box (Fig. 1) – a kind of uninhabited island where these bees must now govern themselves. In this novel environment a new social order is built on aggression and dominance as they fight to secure their place in the hierarchy. The most dominant individual will assume control as the new ‘pseudoqueen’; she will develop her ovaries and begin to lay her own male eggs within a week, while making sure to suppress the ovarian development of her subordinate sisters. In the end, subordinates will resume normal colony jobs as if nothing had changed; they will help their new queen with her brood by carrying out tasks such as building and incubating cells and feeding larvae. Some would say that the bees behave altogether less savage than a self-governing group of isolated humans. Figure 1. The first prototype of my microcolony set-up. The bees feed on a sugar solution from two Eppendorf tubes in the top left of the box. The orange ball in the middle is pollen and the lump off to the side is a piece of wax from the parental colony. In the 1950’s, J.B. Free  was one of the first to officially report record the egg-laying behaviour of workers in colonies of bumblebees that had lost their queen. Work by P. F. Röseler and colleagues during the 70’s and 80’s cemented much of our understanding of social organisation, dominance hierarchies and reproductive plasticity in bumblebees by making comparisons between workers in queenless and queenright colonies [6, 7, 8]. Moving on from this natural history based work, Regali & Rasmont published a paper in 1995  exploiting this bumblebee worker behaviour in order to make comparisons of the nutritional value between certain diets. Their technique of isolating 5 callow (newly hatched adult) workers in a small rearing box became the standard for microcolony experiments across the field. Since then the microcolony approach has been used as a tool to study many other metrics such as worker mortality, the size of the brood comb, the time and quantity of egg laying, the number of larvae (living or ejected), the time and quantity of emerging males and male fitness (measured by weight, size, sperm production and mortality) – to name a few. There are many reasons why the micro-colony revolution took off in bumblebee research. Microcolonies offer extreme flexibility and can be applied to a wide variety of experiments; microcolonies allow individuals to be maintained under standardised conditions; several microcolonies can be created from a single mother colony, making them cheap and easy to reproduce, and allowing large replications within experiments thus increasing statistical power. The microcolony set-up is of particular interest to me because of its wide use among researchers exploring the sublethal effects of toxins (e.g. pesticides) on bumblebees. Much more reliable conclusions can be drawn from experiments of the effects of pesticide exposure bees housed in microcolonies than of those conducted on individual bees because micrcolonies allow for social interactions to take place, without which the behaviour and physiology of individuals would be unnaturally altered. For example, Laycock et al. used a total of 76 bumblebee (Bombus terrestris) microcoloines to show that exposure to environmentally realistic doses of the pesticide imidacloprid can cause significant declines in fecundity, suggesting these pesticides could be directly impacting bumblebee numbers. Worker bumblebees require social stimulation to lay eggs; therefore an experiment such as this, could only be realistically achieved using the advantages of the microcolony approach. I plan to take these advantage one step further and actually look at the social interactions themselves. During my studies I expect to alter and adapt the standard 5-worker set-up to suit my own needs and to explore the full potential of the microcolony. Laycock, I., Lenthall, K. M., Barratt, A. T., & Cresswell, J. E. (2012). Effects of imidacloprid, a neonicotinoid pesticide, on reproduction in worker bumble bees (Bombus terrestris). Ecotoxicology, 21, 1937–1945. Regali, A., & Rasmont, P. (1995). New bioassays to evaluate diet in Bombus terrestris (Hymenoptera, Apidae). Apidologie, 26, 273–281. Meeus, I., Mommaerts, V., Billiet, A., Mosallanejad, H., Van De Wiele, T., Wäckers, F., & Smagghe, G. (2013). Assessment of mutualism between Bombus terrestris and its microbiota by use of microcolonies. Apidologie, 44, 708–719. Otterstatter, M. C., & Thomson, J. D. (2007). Contact networks and transmission of an intestinal pathogen in bumble bee (Bombus impatiens) colonies. Oecologia, 154, 411–21. Free, J. B. (1955) The behaviour of egg-laying workers of bumblebee colonies. The British Journal of Animal Behavior, 3, 147-153. Röseler, P.-F. (1974). Vergleichende Untersuchungen zur Oogenese bei weiselrichtigen und weisellosen Arbeiterinnen der Hummelart Bombus terrestris. Insectes Sociaux, 21, 249–274. Röseler, P. -F. & Röseler, I. (1977). Dominance in Bumblebees. VIIIth Int. Congr. IUSSI, Wageningen , pp. 232-235. Röseler, P., Röseler, I., & Honk, C. Van. (1981). Evidence for inhibition of corpora aliata activity in workers of Bombus terrestris by a pheromone from the queen’s mandibular glands. Experientia, 37, 348–351.